Man's blue sapphire silver ring inlaid with opal and lapis. Man's handmade sterling silver ring inlaid with black onyx. Man's white sapphire ring inlaid with onyx and Australian opal. Unique handcrafted sterling silver man's ring inlaid with bright blue lapis accented with white sapphires by jewelry artisan Mark Hileman. The (4) pave` set white sapphires total .15 carats. The ring is 9mm wide at the top and is a size 9 3/4+. 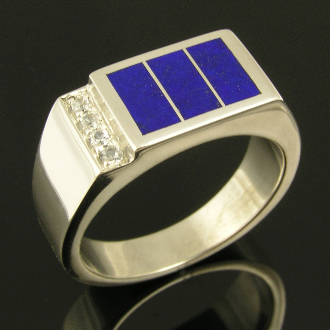 The ring can be made in any size or with other inlay materials by special order in 2-3 weeks. This man's ring would make a great father's day or Christmas gift! Lapis Lazuli has been highly valued for many thousands of years. The most famous locality for fine quality lapis lazuli is the same ancient deposit high in the mountains of Afganistan where it was originally mined at least 6000 years ago. The value of lapis is determined almost exclusively by color, with deep, intense, blue with violet tones being at the apex. Fine grained, uniform specimens, such as the ones used in this ring, attain a smooth highly polished surface not seen in lower grades. Calcite inclusions always lower the value, but pyrite inclusions enhance it in the minds of many collectors and jewelry lovers. The quality of polish, and the artistry of fashioning are also factors in value.